Every year we take thousands of people to the Greek Islands…some are sailors; some have never set foot on a yacht before in their lives. Many have since gone on to buy their own yachts and sail all over the world. 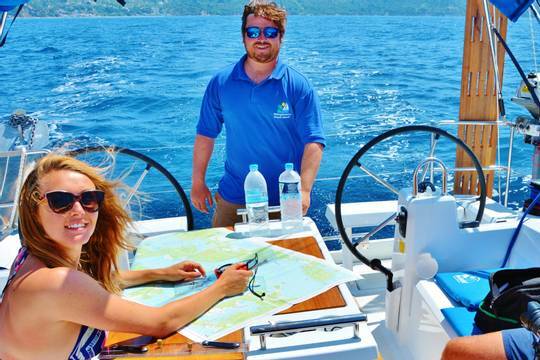 Our laid back approach to flotilla sailing provides the ideal first step to sailing a yacht as well as the perfect way to introduce friends and family. The majority of sailors who sail with us will return the following year, many times together with friends they have made on their previous holiday. Lead crews are chosen for their sailing and maintenance abilities, along with their gregarious natures. Our flotilla skipper has the responsibility of guiding you throughout and will conduct daily briefings covering information about the route, weather and lunchtime anchorages. Your ‘hostie’ is your link with local people and advises on what facilities are available at the next village. The engineer ensures that jobs are dealt with quickly and the yachts remain in good working order. "Fabulous lead crew teams - easy going, professional and attentive"
It is difficult to describe in words the feeling of exhilaration when the breeze fills the sails and the tranquil silence as you turn off the engine. Not to mention the feeling of freedom that comes from jumping off the yacht into crystal clear water and the ambiance that comes when relaxing with fellow sailors in a Greek taverna in the evening. The difference with us comes with our assistance and back up offered by our friendly flotilla lead crew and shore-based teams. They carry a comprehensive selection of tools and spare parts. Our shore based team work closely with our lead crews to ensure things run smoothly and modern internet weather forecasting means that our flotillas are seldom caught out by Mother Nature. We believe everyone should have the chance to sail in sheltered waters, with gentle winds, beautiful scenery, unobtrusive assistance and guidance. For over 40 years the Ionian Islands have offered an unbeatable training ground. "It is a completely unique type of holiday very relaxing but always new places to visit and people to meet, lovely sunny weather, great food and beautiful scenery with lovely little hidden bays and tavernas... Bliss!" The Ionian Islands are one of the safest sailing environments in the world. There are no significant tides, compass variation or cold temperatures to worry about, so you will be sailing in a swimsuit rather than a wetsuit!